We’re making Te Awa o Ngātoroirangi/Maketū Estuary healthier for people to swim and fish in. We're restoring at least 20 percent of the Kaituna River's freshwater flows into the estuary. We’ll also be re-creating 20 hectares of wetlands around the estuary margin, to help filter nutrients and create breeding areas for birds and fish. Construction work began in June 2018 and is due to be completed by June 2020. See our most recent project progress video below. All of the resource consents and conditions for the project were finalised in an Environment Court decision issued in May 2016. All of the land acquisitions and detailed designs for the project have now been completed. See a map of publicly owned land around the estuary. Ford Road will be closed to vehicles and pedestrians between the hours of 7:00am and 7:00pm, on weekdays and Saturdays from 8 February to 27 May 2019. Members of the public that arrive before 7:00am will be permitted to spend the day at Te Tumu Cut at the coastal end of Ford Rd (also known as the Kaituna Cut) provided that they do not do not enter the construction zone - they will not be able to leave until the road re-opens at 7:00pm. During this period, road access will be open to the public all day on Sundays. Ford Road boat ramp and the stop bank on both sides of Ford Road will remain closed to the public at all times from 1 August 2018-30 June 2020. Please use the alternative boat ramp at Bell Road during this time. Video: Kaituna River re-diversion construction area fly over - August 2018. Video: Papahikahawai Lagoon restoration - before and after comparison. Project progress and monitoring results will be reported on annually and updates will be given to the community at quarterly public meetings. Follow this project or subscribe to our e-newsletter below to receive occasional email updates. The last public update meeting and construction site tour was held on 13 February 2019. The date for next community update meeting has yet to be confirmed but is likely to be in May 2019. Check back on this page for details closer to the time. The goal of the Kaituna River Re-diversion and Estuary Enhancement Project is to significantly increase the volume of water (particularly fresh water) flowing from the Kaituna River into Te Awa o Ngātoroirangi/Maketū Estuary by 2018 in a way that maximises the ecological and cultural benefits (particularly wetlands and kaimoana) while limiting the economic cost and adverse environmental effects to acceptable levels. The proposed re-diversion will maximise the flow into the estuary while keeping Te Tumu cut open for flood protection and boating access. For questions, complaints or feedback about this project, please contact the Project Manager, Pim de Monchy, on 0800 884 881 ext 8518 or use the feedback form below. J Swap Contractors and the project team continue to make excellent progress and are on track for Stage 1 commissioning of the new culverts before Christmas, about six months ahead of schedule. Current works include the boat ramp upgrade, wetland shaping, new channel rip-rap placement, fabrication of the stainless steel control gates and construction of the Coastguard’s new berth. This site flyover by Courtney Bell, taken on 18 March, beautifully captures the scale of the works. Construction work on the Kaituna River re-diversion project is now about one-third of the way through and progressing well ahead of schedule. Read the December 2018 Newsletter. Regional Council staff are encouraging whitebaiter fishers to also look for new options with the opening of the whitebait fishing season this week. While local fishermen have settled in to new spots for boat launching and surfcasting since the temporary closure of Ford Road took effect on 1 August, Regional Council staff are encouraging whitebaiter fishers to also look for new options with the opening of the whitebait fishing season this week. “We’ve tried to let as many people as possible know about the road closure, but it may still come as a surprise for some whitebaiters that haven’t visited since last year,” said Kaituna Catchments Manager Pim de Monchy. Access to the lower Kaituna River via Ford Road is currently closed until 20 December 2018, due to Kaituna River re-diversion construction works. Access to Ford’s Cut and the stop banks on either side of the Cut will remain closed until the construction project is completed in June 2020. The Bell Road boat ramp remains open for people to launch onto the Kaituna River. “Changes to flows through Ford’s Cut will make it less suitable for whitebait during the construction period, so fish numbers will be low there anyway. The re-diversion project will improve fish habitat and the health of Te Awa o Ngatoroirangi Maketū Estuary in the long term. In the short term, whitebaiters will need to try some new fishing spots nearby. "The lower ends of the Kaikokopu, Pongakawa and Wharere Streams can all be accessed via public roads, as can the Maketū and Waihī Estuary entrances. If people are prepared to walk, they can also get to the Kaituna River through the Lower Kaituna Wildlife Management Reserve on Pah Road,” Mr de Monchy said. Mr de Monchy said that the partial restoration of freshwater flows from the Kaituna River into Maketū Estuary is just one of the many projects underway that will benefit whitebaiters over time. “Whitebait species spend most of their lives in freshwater rivers and streams. We’re working with landowners to identify and reduce run-off sources, restore wetlands, plant stream margins, and take other steps to restore water quality and fish habitat that has been degraded through historic land use change. "In the past year we’ve delivered 22 riparian improvement projects in the Kaituna Pongakawa catchments; protecting 33km of waterways, in partnership with landowners. Those projects have included work to improve the spawning and rearing habitat of inanga which is the main species in whitebait catches here,” he said. Ford Road access to Te Tumu Cut and Maketū Spit will be closed from 1 August until 20 December, to enable construction work that will restore 600,000 cubic metres of freshwater flows into Te Awa o Ngatoroirangi Maketū Estuary on every tidal cycle. “We know the area is popular with fishers and we’re really sorry for the inconvenience. 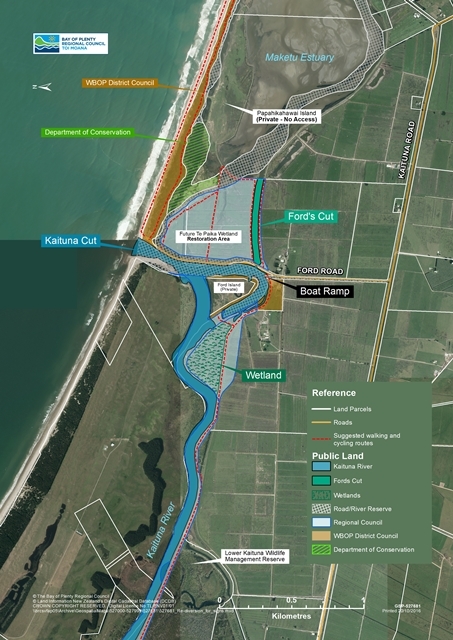 But this project will benefit them in the long run with improved facilities, estuary health, and kaimoana (fish and shellfish) habitat,” said Bay of Plenty Regional Council Kaituna Catchments Manager Pim de Monchy. Ford Road is scheduled to re-open in time for Christmas fishing, but the Ford Road boat ramp will remain closed until construction work is completed in June 2020. White-baiting in Ford’s Cut will also be affected until June 2020, due to restricted water flow and stop bank access throughout the construction period. Bell Road boat ramp will remain open throughout the construction period. Mr de Monchy said that existing levels of boat access through Te Tumu Cut (also known as the Kaituna Cut) will be maintained once the project is complete. He said that flood protection levels will also remain the same for properties in the Kaituna Catchment Scheme and Maketū township. Bay of Plenty Regional Council is funding and delivering the $16m Kaituna River re-diversion project that was first called for by the community in 1979. Construction work started in June this year. The project includes creation of an 800m long new channel to carry fresh water from the river, through a new enlarged diversion control structure and down a widened Ford’s Cut, into the estuary. Existing stop banks will be shifted and upgraded. Briefing notes and meeting notes from the group's sixth workshop, held on 20 September are now available online. The group discussed catchment modelling assumptions and scenarios, They also explored land and water use values. More than 100 people, including representatives from six Te Arawa iwi gathered at Tukotahi Marae yesterday, beside the Kaituna River, to celebrate the start of construction works that will return freshwater flows from the river into Te Awa o Ngatoroirangi Maketū Estuary. Ngāti Whakaue kaumatua Liam Tapsell started the celebration by thanking Bay of Plenty Regional Council Project Manager Pim de Monchy and his team for their collaboration with Te Arawa whanui and the local community in bringing the project to fruition. “Let us celebrate and honour the spiritual essence of the Kaituna and the estuary Te Awa o Ngatoroirangi,” he said. Regional Councillor and Te Maru o Kaituna River Authority member Arapeta Tahana acknowledged the work of Aroha Wilkinson, the Maketū Action Group, and the wider community in their work since the late 1970s to get the river re-diverted back into the estuary. “I’m really pleased that as a community and as a nation we’re realising the impacts of some of the things we’ve done to the land and the waterways in the past. We’re now making a commitment to turning the tide and making a change for the better. Everyone who lives in this community has been really dedicated to this kaupapa (work) and I want to acknowledge and thank everyone that has played a part in getting the project this far. We’re not going to be here forever but this land will be, this river will be, and this moana will be so it’s only right that we do the best we can as our generation to leave this whenua and this environment in a better condition for our children and our grandchildren,” Councillor Tahana said. As the last surviving member of the original Maketū Action Group, Aroha Wilkinson finished the ceremony by turning the first sod while Ngāti Whakaue Minister Kahi Hanara gave a karakia. Mrs Wilkinson used a spade that belonged to her late husband Barrie Wilkinson and was supported by her sons Pete and Aubrey Wilkinson. Regional Council Chairman Doug Leeder presented Mrs Wilkinson with a kahikatea tree which will be planted in the first sod at nearby Whakaue Marae. Bay of Plenty Regional Council is funding and co-ordinating the $13m construction works which are due for completion by June 2020. $3.6m has already been invested in the planning and land acquisition work completed to date.